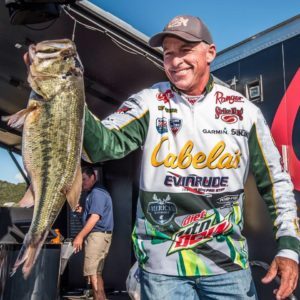 Having successfully competed for the last 25 years in national tour level circuits, including both the FLW and Bassmaster trails, Clark Wendlandt is one of the most accomplished tournant anglers in the history of the sport. A 1989 graduate of Texas A&M University, Wendlandt began his professional fishing career in 1992 following a first place finish in the BFL All-American Tournament. In addition to being a three-time FLW Angler of the Year, Wendlandt has 40 top ten finishes, 4 wins and 17 Cup appearances on the FLW tour. He qualified for the Bassmaster Classic four times and collected 16 BP Top 100/150 B.A.S.S. top ten finishes during his stint with B.A.S.S. He has also won the Ranger Cup Award three times and is a three-time medalist at the ESPN Great Outdoor Games. Wendlandt is the host of Fishing and Hunting Texas, is a guest host for Cabela’s Fisherman’s Handbook and is a part of the Americana Outdoors TV Show pro staff. Wendlandt lives in Leander, Texas with his wife. When not fishing or filming, he gives seminars and speaks at various local and national events where he promotes outdoor life and the sport of bass fishing and the businesses that make them possible. In his spare time, Wendlandt enjoys spending time with his family, hunting and more fishing.